Derry Colts U12s who ended their season with a fine win over Ballinamallard. DERRY COLTS will be seeking to book their place in the final of the Subway sponsored NIBFA League Cup Under-14 Final when they travel to Belfast on Saturday to take on Cliftonville in a semi-final clash. The Belfast Reds will start the game as red-hot favourites but Colts will be confident of causing an upset following a very favourable result last weekend in the National Youth League where they defeated promotion chasing St Oliver Plunkett’s. That game was considered their most important match of the season so far as Plunkett’s required a point to secure their place in the Premier League next season while only three points would suffice for Colts in their quest to remain in the top tier. Plunkett’s started the game on the front foot early on and put Colts under pressure in the opening 10 minutes. Gradually Colts gained the upper hand and created the first real chance midway through the half when Tiarnan McKeever out-stripped the Plunkett’s defence and steered his shot past the keeper only to see it roll past the post. Plunkett’s then hit the woodwork when a drive from the edge of the box sailed past Gallagher in the Colts goal but brushed the post and went wide. Derry Colts Ryan Kennedy attacks the Glens defence. Five minutes before the break Colts opened the scoring when MATTHEW STEVENSON headed home a Dermot Magee free kick to give Colts a precious lead at half-time. Plunkett’s began the second half in search of the equalising goal but they were generally forced to shoot from distance and Gallagher was not troubled in the Colts’ goal. However, 10 minutes from time, Plunkett’s equalised in controversial circumstances. Colts’s defence stepped up to play the offside trap and although the Plunkett’s striker looked clearly in an offside position, the referee waved play on and the striker coolly slotted the ball past Gallagher to make it 1-1. Five minutes from time Colts hit back as Reece McGilloway picked the ball up wide on the left and whipped in a low cross which the keeper could only parry into the path of RIANN NORRBY who gleefully smashed the ball home. Derry Colts' Dominic Dunne takes control against Glentoran. Plunkett’s once again came in search of an equaliser but the Colts’ defence held firm to seal an excellent victory. Derry Colts U14: Jackson Gallagher, Dermot Magee, Jamie Mellon, JP Harkin, Matthew Stevenson, Sean Duffy, Jack Bradley, Tiarnan McKeever, Rory Mc Dermott, Connor Kelly, Riann Norrby, Reece McGilloway, Eoin McKenna, Oissine McGuinness, Jack Leddy and Shea Clarke. Stuart Moore confidently catches the ball under intense second half pressure from Glentoran. This was an excellent showcase for underage football. Derry Colts created several great chances in the first half as Murtagh and McCrudden caused the Glens all sorts of problems with their movement and penetrating crosses into the box. 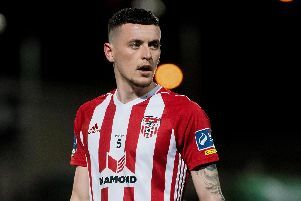 Derry thought they had scored from a McGinley freekick which was flicked on by McCrudden to Dunne whose run from deep and finish was adjudged to be offside. The Glens were unlucky not to score on two occasions, firing narrowly over and drawing a fine save from Caoimhin Quigg. But it was the young Candystripes who deservedly opened the scoring. A Ryan Kennedy free kick was well met by Nathan McCrudden whose volley was parried by the keeper, fortunately the rebound fell back to McCrudden and he made no mistake cooly lifting the ball over the keeper. As the second half got underway Derry goalkeeper Caoimhin Quigg sustained an injury as he fell awkwardly but Stuart Moore seamlessly filled in. With roles reversed it was the Glens who were now in the ascendancy with Derry hitting their opponent on the counter attack. When Cormac McGinley played a great ball with the outside of his foot to Nathan McCrudden, the Derry Colts man hit a powerful shot into the bottom left hand corner making it 2-0 to the visitors. With 10 minutes to go the Glens pulled one back, however, Derry’s defence killed the game off. Derry Colts U13s: S Moore, C Quigg, S Monaghan, C McGinley, S Frazer, E McSherry, A Murtagh, C Porter, R Kennedy, J Robb, N McCrudden, A Callaghan, D Dunne, A McClafferty. Results: National League A Section; U16 Derry Colts 2, Dungannon Swifts 1; U14 Derry Colts 2, St Oliver Plunkett’s 1; U13 Derry Colts 2, Glentoran 1; U12 Derry Colts 6, Ballinamallard 2.